So on May 1st 2016 I actually ran a half marathon yup thats right 13.1 miles.... most of you reading this will be like whats the big deal you do ultra triathlons well it was a big deal I have been suffering from Antilles Tendonitis since February 7th and dropped out of the LA Marathon at mile 4. on Feb.14th. Dealing with this injury is no fun and I seeked help in the prevention of it again. I had a Running Analyst test done by Covina Hills Sport Medicines and the therapist Michele Rebozzi was astounded that I did not engage my glutes when running!!! I will write another blog about this as it deserves its own recognition! The day before the event I went to the expo and down graded my entry from the full marathon to the half marathon as I lacked the training and conditioning to do justice for the 26.2 miles and opted for 13.1 miles hoping I had made the right choice...at this moment my thought was on the bling bling namely an awesome Beach City Medal for doing Long Beach, Surf City and OC with in the right timeframe. It was a golden Sand Dollar and my love of the Ocean I just had to have this for my collection!!! Went with the intention of finishing pain free...if my tendon started to hurt on the uper scale of 5 out of 10 or more I would quit. Enjoyed the pre-race expo with friends from So Cal Pacers an awesome running group I belong to that is like a family!! I was able to spend a little time with my friends at the Kool n Fit booth too. Race morning began at the unearthly hour of 3am... yup 3 am not a typo.... luckily I was car pooling with friends from SOCAL pacers so at least I could relax a little. We arrived a little after 4am plenty of time to use a bathroom, catch the shuttle and warm up. My friends were doing the full so I cheered them on and then focused on my event of the half. There was def. a lot more half marathoners than full there was just a sea of faces and I started not in the front corral as I would normally but decided to start in corral 3. Due to the fact I was coming back from injury... lets just say after the national anthem was sung it was crazy!! I kept saying to myself no pressure just enjoy the event I started people watching and let my race unfold. Within the first mile I decided on the portapotty pit stop, and then was rejuvenated for the next 12 .2 miles. I ran every mile with a smile, I ran lightly as if I was running on egg shells and listened very carefully to my tendon...it never really hurt and I tried very hard to keep to the center of the road. The miles just fell off I was having fun I kept looking at my Polar monitor and it kept telling me I was getting closer to the finish... I met SO many athletes I have not seen in years and yup I stopped to jog and say hi to them all!! At mile 4 I had to ditch my fuel belt it has been a great companion over the years but it was worn and tired and ended up parting ways not after taking out my two gel bottles that had my Hammer nutrition and extra gels in the pouches. The views were spectacular of the Ocean and wonderful homes. The aid stations were plentiful. At mile 7.5 i ran a little with a Californian Firefighter he asked if I had an extra Hammer Gel I did and another photo op was born! Mile 12 came I made a left and secretly laughed inside I was going to finish my longest none stop run in 2 months I did not have to run another 14 miles the OC County Fairgrounds were in sight and that awesome Beach City challenge medal would be mine in less than 9 minutes! I encouraged other runners to keep running the finish line was in sight I raised my hands in jubilation I had finished and my time you ask...well not a PR that's for sure but I will take a 1 hour 54 minutes as I have missed running and the enjoyment it brings! A huge thanks to my friends at So Cal Pacers for their kindness in carpooling for Sat and Sunday. 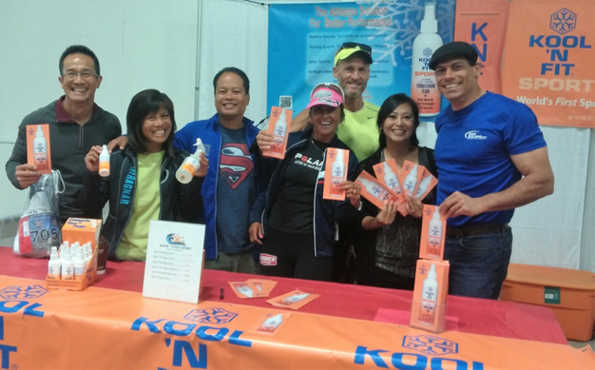 Shout out to my sponsors at KoolnFit for introducing me to Gary the Race Director and talking me into signing up back in October at Long Beach Marathon expo! I sprayed KoolnFit into my shoes and stopped at mile 10 at their spray station. My race day nutrition was Hammer Nutrition I had two hammergels in my fuelbelt bottle and endurolytes before and during the race. as well as a Hammer Nutrition bar for recovery at the finish line. I actually had a light breakfast at 3am as my race did not start until 6.15am and I had no stomach issues what so ever! I listened to my heart using my Polar M400 a runners must have for training and racing an awesome monitor I tracked my heart rate through out.and it gave me a little picture of a cup for completing my longest run to date!!! ha ha. I ran Happy with my Brooks Running attire and actually wore my Brooks Trail shoes just for the extra support for my tendon. Big thanks to Rudy Project for helping me look like a rock star too. A Few things about the OC Marathon Venue. It is extremely well organized, changing my marathon bib was just simply going to solutions and within 5 minutes I had the same number but registered in the half distance. I was able to get an XS womens t shirt was super happy about that. In the morning of the marathon there was no problem with parking and there were plenty of buses available to shuttle the athletes to the Starting line. and with that I would have to mention plenty of portapotties and the Brown UPS vans were amazing taking race bags with athletes warm clothes for the race finish. A really scenic course the Ocean views were breathetaking and then the beautiful homes and bridge crossing were fun too. It is mainly a downhill marathon with hardly any hills a few bumps!! Post Race there was plenty of hydration again well organized finish line and was plenty to do at the post and pre race expo. Great venue for spectators to watch too... not sure why I waited 9 years to do this event it was a great experiance! !